Stephen Quinn is a salvager who does not have a permanent home. He lives during the time of the 11th plague where many people lose their lives because of a deadly disease. Throughout his life, he experiences many things that many have not. He lived with his grandfather, mother, and father. Soon, his grandfather and mother both die, and Stephen and his father only have each other. As Stephen's dad falls into a coma, he stays in a community, Settler's Landing. As he lives there, he quickly realizes that he does not fit in. While Will and his group of friends and family make it their goal to force Stephen to leave the community, he meets Jenny, a chinese adopted teenager, who is an outcast and lives in a barn away from her family. She is also not welcomed in the community and is treated poorly by many people because of her ethnicity. Will and his friends make excuses and lies to convince everyone that Stephen and Jenny are not good for the community and are only trouble to everyone. As revenge, Jenny and Stephen decide to pull a prank on the community. When the plan goes horribly wrong, chaos erupts. Stephen and Jenny try to fix the misunderstanding, but it is too late. A battle starts between Settler's Landing and Fort Leonard, a neighboring community, which changes the community and the future. Now, Jenny and Stephen must hide because they are suspected of helping Fort Leonard. When I first opened the book, I did not expect the first chapter of this book to begins with the main character’s grandfather’s death. The harsh beginning is definitely something that caught my attention. At first, I expected the storyline to be similar to most tragic novels, but as I read on, I realized that it is in fact quite different and provides a great understanding of experiencing many changes. 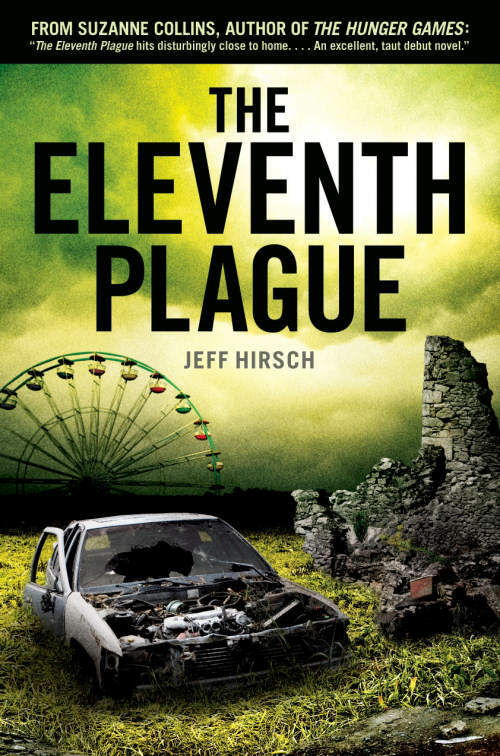 The 11th Plague grabs the readers’ attentions without any difficulties because readers can relate to the various themes in the story. This book can easily be read because of its simple vocabulary. Unlike many novels, this book never lost my attention and always had me wishing for more. I would recommend this book to students of ages between twelve and fourteen because it provides a great theme, resolution, and plot that can help students improve their knowledge on literary terms. Overall, I would rate this book nine out of ten stars. 1. How did Stephen’s dad fall into a coma? 1a. While they were trying to free slaves, Stephen’s dad managed to step on the part of the ground which was actually mud. He went flailing backwards. 2. Who wants to help Stephen and his dad? 2a. Marcus wants to help Stephen and his dad. He thinks that his wife, Violet, can help stephen’s dad because she is a doctor. 3. What surprises Stephen most about Jenny? 3a. Jenny is an asian girl living with a white family. 4. What fake name does Marcus give Stephen when he doesn’t reveal his real name? 4a. The fake name Marcus gives Stephen is Aloysius. 5. What is P. Eleven? 5a. It is a disease that makes everyone sick. 6. How does Stephen get strike one? 6a. Stephen gets strike one by punching Will. Mr. Tuttle catches him. 7. As a scavenger, what routes do they take? 7a. They take different routes, so people cannot predict where they are. 8. What was Jenny’s and Stephen’s punishment by Mr. Tuttle? 8a. They had to copy down 3 chapters of the American History Book. 9. Where did Stephen run away to? 9a. Stephen runs away to the barn where Jenny lives. 10. What did Jenny and Stephen do for revenge? 10a. They set the fire crackers on fire and said that they were from Fort Leonard. 11. What did people do after Jenny’s and Stephen’s prank? 11a. The community decided to attack Fort Leonard. 12. Why did Marcus tell Jenny and Stephen to hide? 12a. Marcus told Jenny and Stephen to hide because they were accused of helping Fort Leonard. 13. Stephen thought Fort Leonard hired the slavers, but instead who hired them? 13a. Marcus and people from his town, Settler’s Landing, hired the slavers. 14. What does Stephen do to stop the uprising war? 14a. He tells people from both Settler’s Landing and Fort leonard that it was his fault and the shooting was just a mistake. He brings peace to both communities. 5. What does Jenny do at the end? 15a. Jenny finally leaves the community to be a scavenger with Stephen. She promises to visit her family.